Epiphytie or terrestrial, usually creeping; stems elongate, rooting at nodes; the internodes 2-21 cm long; cataphylls to 8 cm long, early deciduous. side, scarcely more conspicuous than the inter-primary veins, sunken above, raised below; collective vein arising from the base, 4-5 mm from the margin. INFLORESCENCE erect-spreading, longer than leaves; the peduncle 3.5-14 cm long; spathe lanceolate, green tinged reddish, subcoriaceous, 1.5-3 cm long, 0.5-1 cm wide, abruptly acuminate at apex, acute at base; spadix green to red, scarcely tapered, 2.5-3 cm long, 4-5 mm diam. midway (dry); flowers rhombic to 4-lobed, ca. 2.2 mm long, 1.9 mm wide (dry), the sides straight to weakly sigmoid; 4-5 flowers visible in the principal spiral, ca. 7 flowers visible in the alternate spiral; lateral tepals 1.6 mm wide (dry), the inner margins straight to convex, pistils raised, weakly emergent; stigmas linear, 0.3-0.4 mm long; stamens emerging in a ± complete sequence from the base; anthers held in a tight cluster over pistil; thecae broadly ellipsoid. INFRUCTESCENCE with spadix to 8 cm long; berries white, turning purple at maturity, oblong, ca. 1 cm long; mesocarp clear, gelatinous; seeds 2, dark violet-purple, ca. 4 mm long, 2 mm wide and 1.5 mm thick. Figs. 201 and 202. 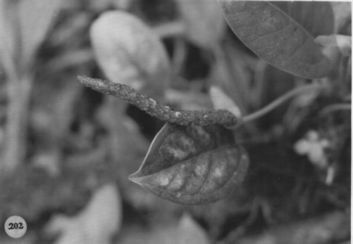 Anthurium tonduzii occurs in Costa Rica and Panama at 800 to 1,500 m elevation in premontane rain and lower montane rain forest. It has been collected on Cerro Pirre in Daricn Province of Panama and is to be expected in Colombia in the Department ofChoco. The type collection was made in 1893 and no collections have subsequently been made in Costa Rica but the species has been collected five times between 1975 and 1977 in Panama. 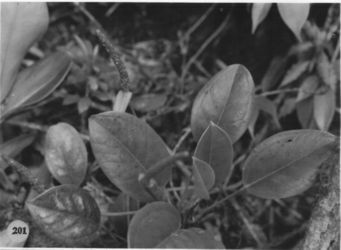 Anthurium tonduzii is in section Tetraspermium and does not appear to be related to any other species (certainly to no Central American species), but it looks superficially like A. scandens and A. trinerve because of similar small, punctate leaves and scandent habit. It differs from both by its longer internodes and entire deciduous cataphylls. The cataphylls of A. scandens and A. trinerve soon weather into fibers and persist, densely covering the stem.